In a previous article, surgery expert Aidan McAlinden discussed the abnormalities that contribute to the syndrome Brachycephalic Upper Airway Obstructive Syndrome (commonly abbreviated to BUAOS) in brachycephalic breeds and the symptoms that result. He explained how the shortened, flat skulls cause overcrowding of the soft tissues in the nose and throat, making it difficult for these dogs to breathe. In this article, Aidan looks into the indications for surgery and how your vet will confirm a suspected diagnosis of BUAOS. The main abnormalities contributing to the syndrome that we can address surgically are the narrowed nostril openings (stenotic nares) and the elongated soft palate. Many of these dogs develop secondary laryngeal (voicebox) collapse and this can make their symptoms worse. Certain degrees of laryngeal collapse may also be addressed with surgery. It is important to seek veterinary attention if your pet develops any of the above signs. The signs at the milder end of the spectrum are often discounted by many owners as being ‘normal’ for the breed. This is often not the case but rather reflects our skewed view in what is acceptable for some of these breeds. It has been well documented in the literature that brachycephalic dogs can develop secondary laryngeal collapse as early as four months of age. It is therefore paramount that dogs showing symptoms compatible with BUAOS are assessed and treated as early as possible. Early surgical intervention before the onset of secondary laryngeal collapse may offer a better prognosis in the long-term by preventing or delaying its occurrence. How is a suspected diagnosis of BUAOS confirmed? The symptoms, breed and age of the pet are often very suggestive for a diagnosis of BUAOS. Confirmation of the diagnosis requires the surgeon to look into the back of the throat, larynx and possibly the trachea (windpipe). To do this the dog’s mouth needs to be held open with a little brace or gag and the tongue needs to retracted. This is not painful but has to be performed under anaesthesia for compliance reasons. We cannot ask these dogs to “open your mouth and say ahhh” as we might do in a human! This picture shows the throat of a brachycephalic dog. 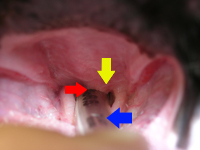 The soft palate is too long (yellow arrow), impinging on the entry to the larynx (red arrow) which is just above the endotracheal tube (blue arrow). During this time oxygen is administered and the surgeon will carefully inspect the nostrils, assess the length and thickness of the soft palate and look at the larynx for evidence of collapse or dysfunction. A small flexible camera (endoscope) is often passed into the throat to illuminate the area and improve visualisation. The camera is usually passed into the trachea and bronchi to assess their diameter and to look for evidence of collapse during breathing. The nature and severity of the abnormalities are quantified and a treatment plan is made. Is the surgical treatment carried out under the same anaesthetic? It is my personal preference to perform the corrective surgery at the same time as diagnosis. This means the patient only has a single anaesthetic and it reduces the risk during recovery. Patients recovering from anaesthesia with the excessive soft tissue still in place may be more likely to develop compromised breathing during recovery. In the next article we will discuss what the surgery involves and what happens afterwards. 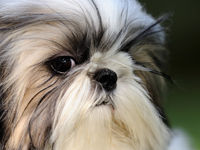 Parvovirus in Dogs – a Returning Disease?